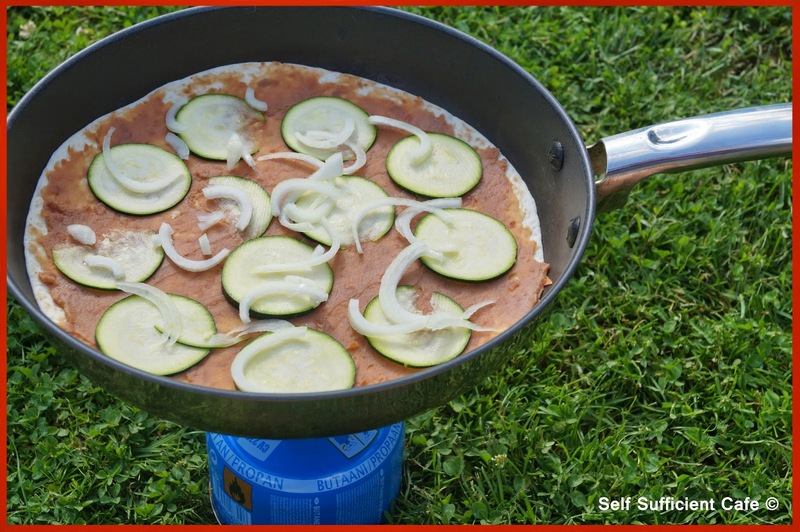 A few days ago I posted my first camping recipe - Courgette & Onion Quesadilla's and if you make these you might find that you have some refried beans left over. Well, not being one to waste anything the remainder of the refried beans can be used in this recipe. If you have more than the recipe calls for don't worry add whatever you have. 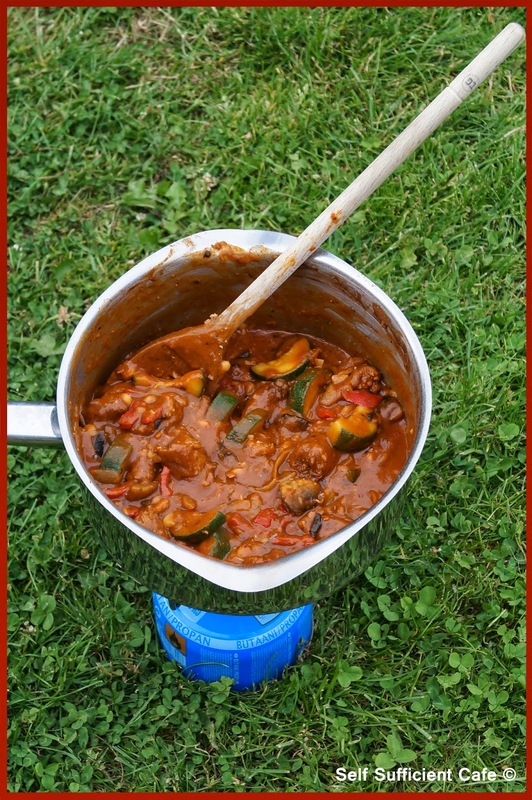 I have been known to make the whole dish before I go camping and ask my Mum to freeze the chilli for me (remember I have no freezer). Once frozen it can be used as an ice block for your cooler box and once thawed you can then heat it up for dinner. Nice tip eh? 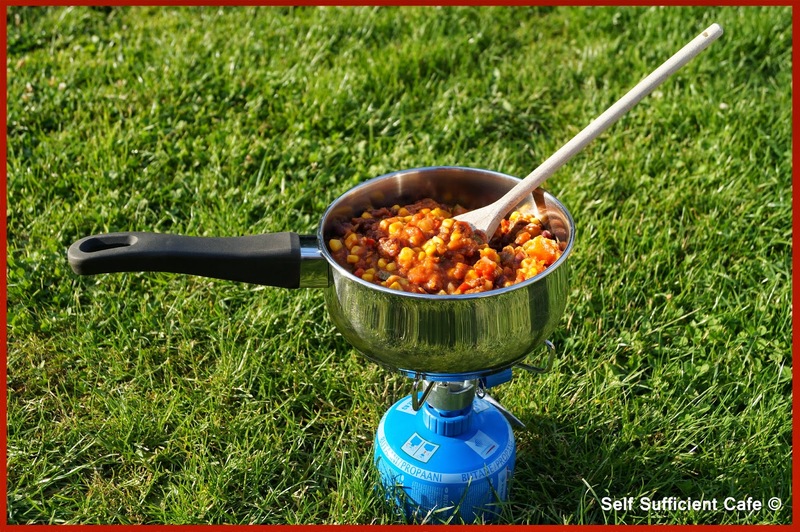 If you're planning on making this whilst you are camping another good tip is to make up the spice blend before you go and then you won't need to carry lots of jars with you. Remember to make a note of whats in the jar so you don't get confused between the hotpot spice blend and this one! First make up your spice blend. Add the cumin seeds to a pestle & mortar and grind to a fine powder, add the remainder of the spice blend ingredients and mix. Tip into a small jam jar and set aside. Fry the onion in the olive oil for 4-5 minutes or until translucent, add the red pepper and fry for another 2 minutes. Add the courgette and fry for a further 2 minutes before adding the mushrooms. Continue to cook for another 2-3 minutes. Add the spice blend (as much as you fancy) I actually use all of it as its not that hot. If you like things hot add more cayenne pepper or add chilli powder to the blend. Stir to combine everything. 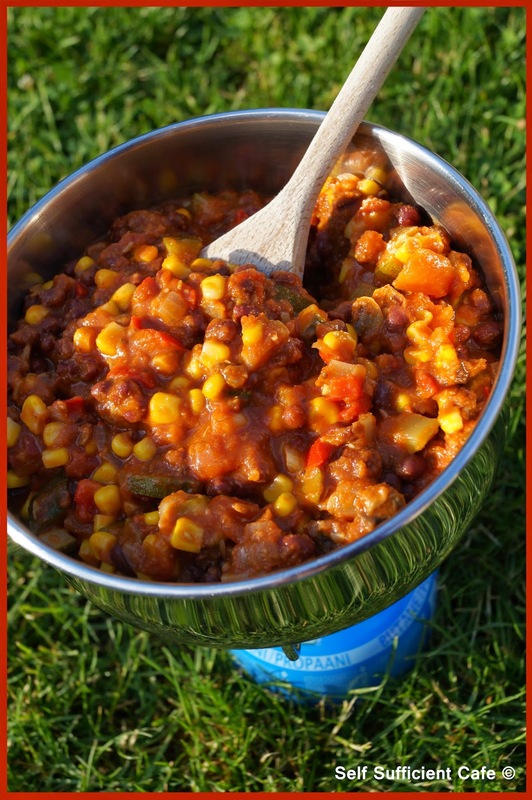 Add the tomatoes, refried beans, adzuki beans and sweetcorn and stir to combine everything. Make sure the refried beans are fully incorporated into the mixture. Bring to a simmer and cook for another 5 minutes. 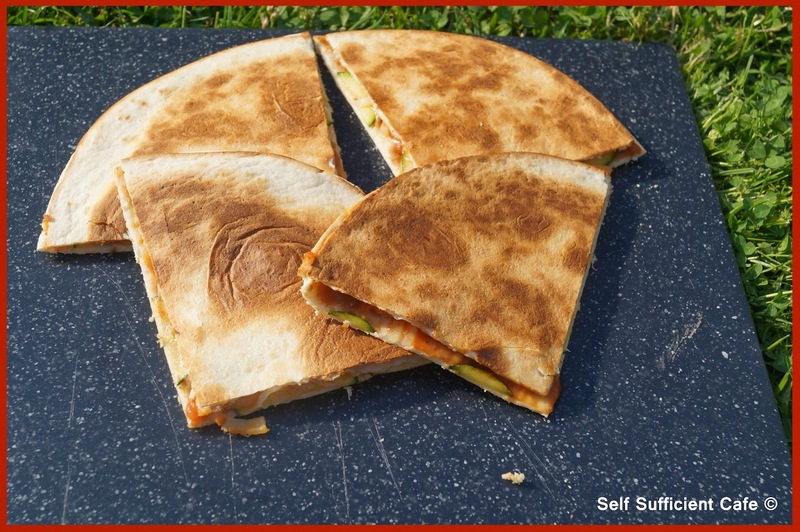 Serve with corn chips, pitta bread or taco shells. I boiled up some pasta and mixed into the chilli. A couple of days ago I was going to post a chocolate pudding recipe, but I wasn't completely happy with my recipe as I wanted to do some tweaking. After another couple of hours in the kitchen I'm now ready to share my recipe. I'm not a very confident baker, I normally follow recipes and tweak them with ingredients I have to hand, but my chocolate pudding recipe was started from scratch. 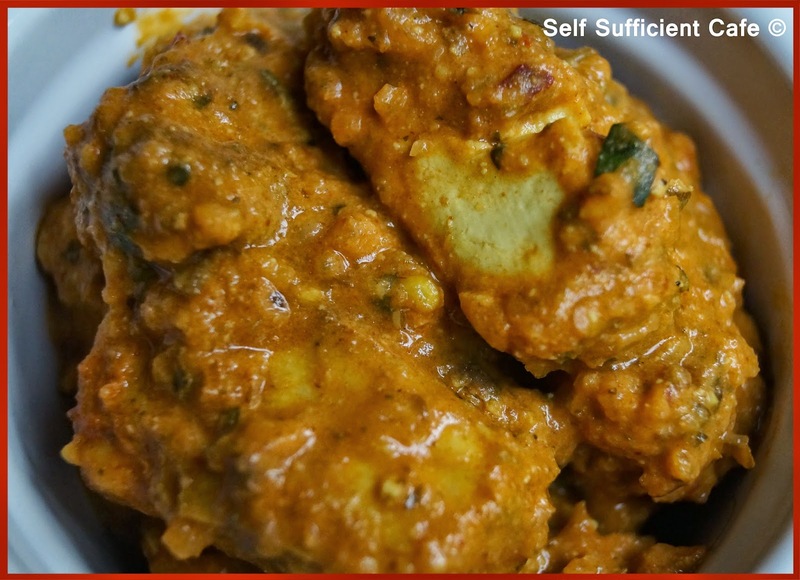 I thought to myself if I can create a savoury recipe as I go then it shouldn't be that difficult to 'wing' a sweet recipe. So how did I know it was going to turn out alright? I kept tasting the batter! 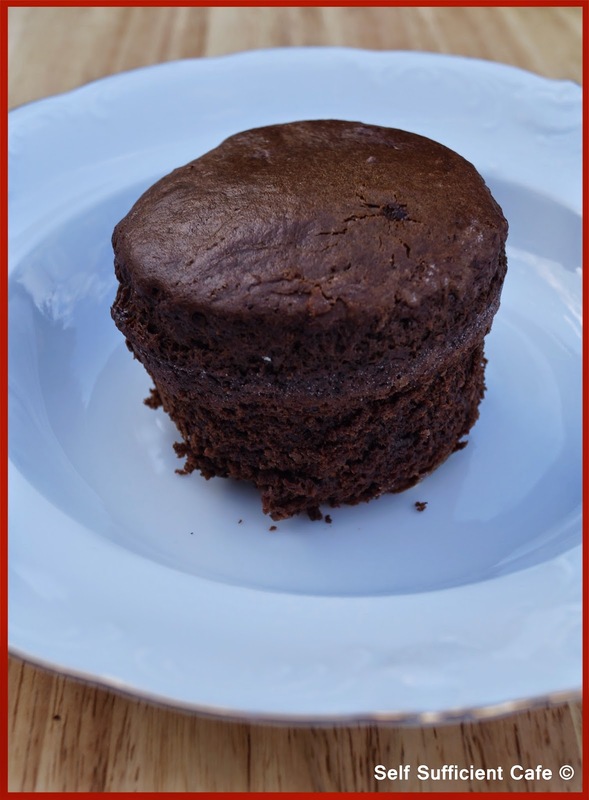 In fact the recipe below should make 4 chocolate puddings but as I kept tasting the batter I only made 3! Plus I filled the ramekins too much, I really wasn't expecting the puddings to rise quite as much as they did. When I took them out of the oven they reminded me of chocolate souffles, they had risen that much! 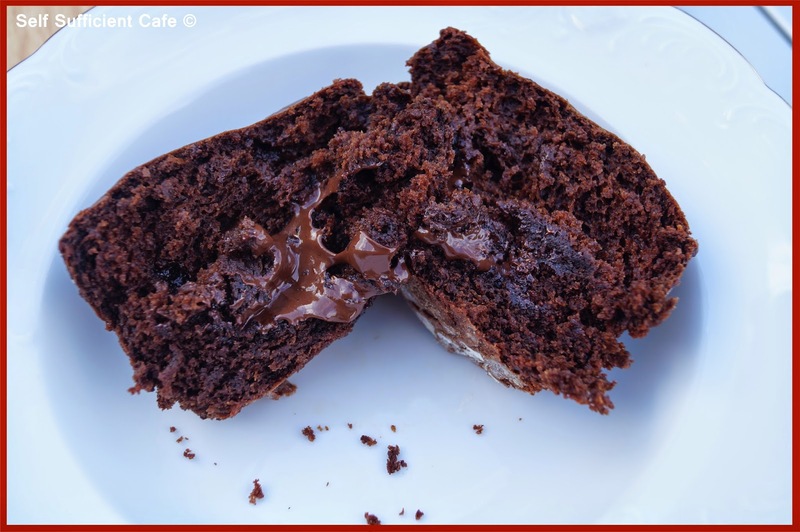 If you haven't got much time and you're not a confident baker then this recipe is for you, its really easy and it doesn't take long to cook! 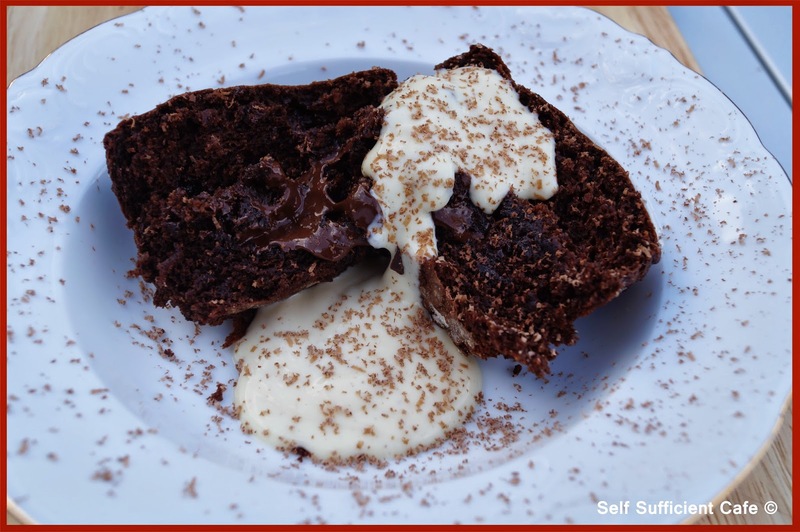 Be warned though these puddings are extremely rich and very filling! Sieve the first 5 ingredients into a bowl and add the sugar. Stir to combine. Add the last three ingredients to another bowl and whisk so that all the ingredients are combined. Pour the wet ingredients into the dry and mix until you have a batter. Grease 4 ramekin dishes and dust with flour. 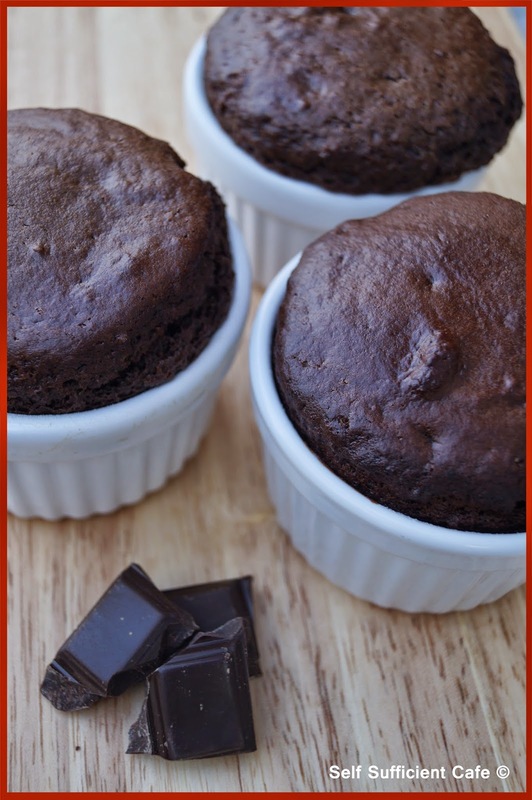 Place 2 Tbsp of the batter into each ramekin dish and top with 2 squares of the dark chocolate. Add another 2-3 Tbsp of the batter on the top and smooth over the surface. Place in a preheated oven at a moderate temperature (my oven temperature marks have been rubbed off so I never know what temperature my oven is!) and bake for 15 minutes. Remove from the oven and place a skewer into each of the puddings, don't go into the middle though as this is where the melted chocolate is! If the skewer comes out clean you're ready to go. If not place back in the oven and bake for another 5 minutes they really shouldn't need any longer than this. Serve with extra vanilla yoghurt and grated chocolate. 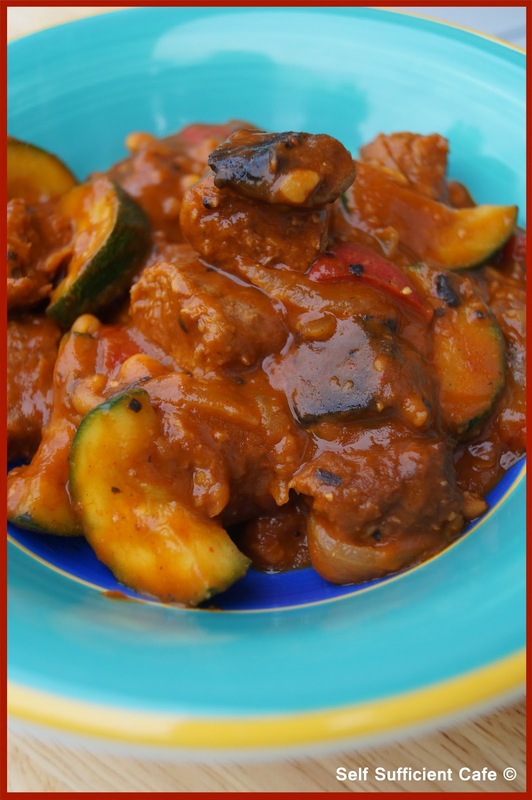 I don't know why, but this recipe tastes better when cooked and eaten outside! Weird huh? Maybe it is just enjoyed more after spending the day outside dosing up on that vitamin D and when you've burned up calories after clocking up miles and miles on a view satisfying walk? 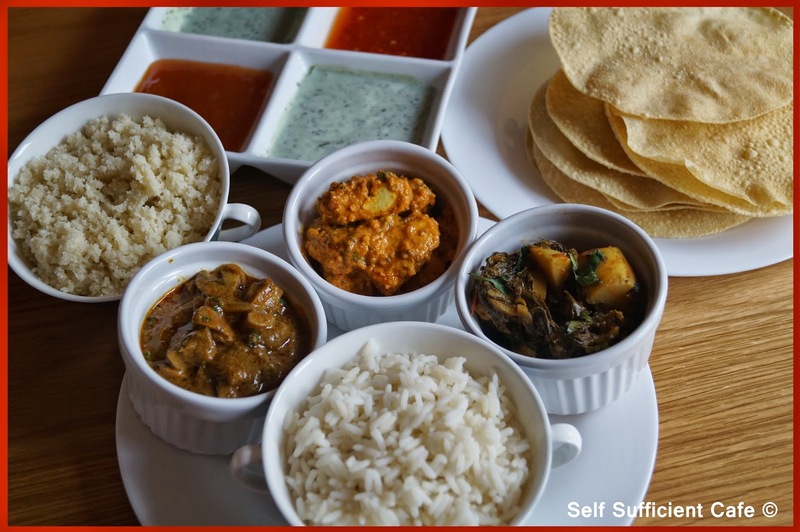 To make life simpler I have a couple of tips to share with you for this recipe too. Making this one pot cooking at its best. If you've not cooked the sausages at home, then fry in a saucepan over your stove until cooked and set aside. Fry the onion in the olive oil for 3 mins or until translucent, add the pepper and continue to cook for another 3 minutes. Add the courgette and cook for another 2 minutes before adding the mushrooms and cooking for a further 2 minutes. Add the herb and spice mixture and give everything a good stir. Add the baked beans and give everything another stir to combine all the vegetables. The mixture will look a bit 'gloopy' so add the water to thin, don't worry if it looks ruined it won't be! 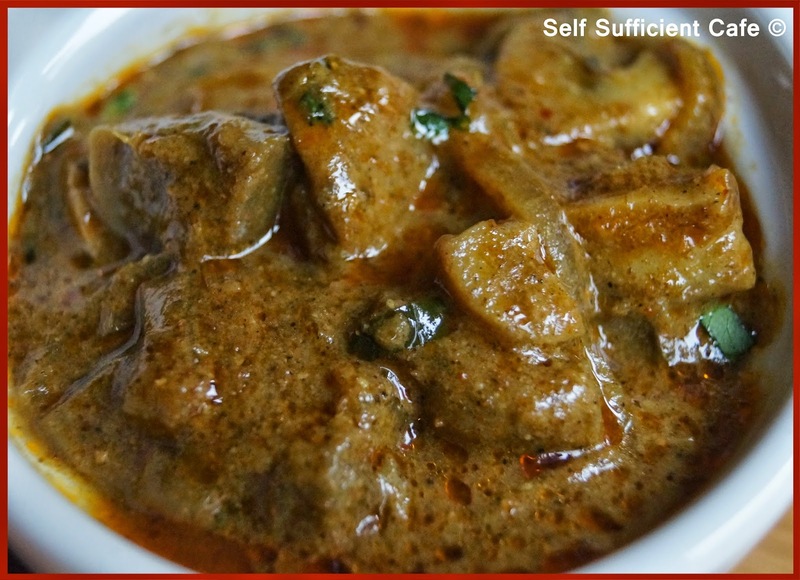 Turn up the heat and bring everything to a simmer and cook for 4-5 minutes until the mixture has thickened slightly. Add the tomato puree and give everything a good stir to mix in the puree. Cut up the sausages into 4 pieces and add to the pan. Cook for another 3-5 minutes to heat through the sausages and serve straight away. 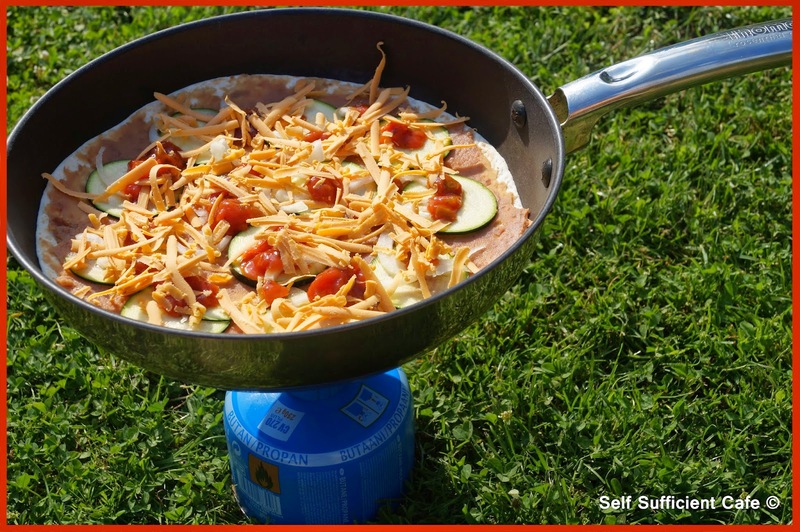 If you have another stove ring you could serve this with rice, new potatoes or pasta. But don't worry if you just have the one ring you can serve it with couscous. Before you start cooking the hotpot, boil up some water and pour over the couscous as per the packet instructions. If you do this in a mess tin and cover with silver foil it should stay warm enough. 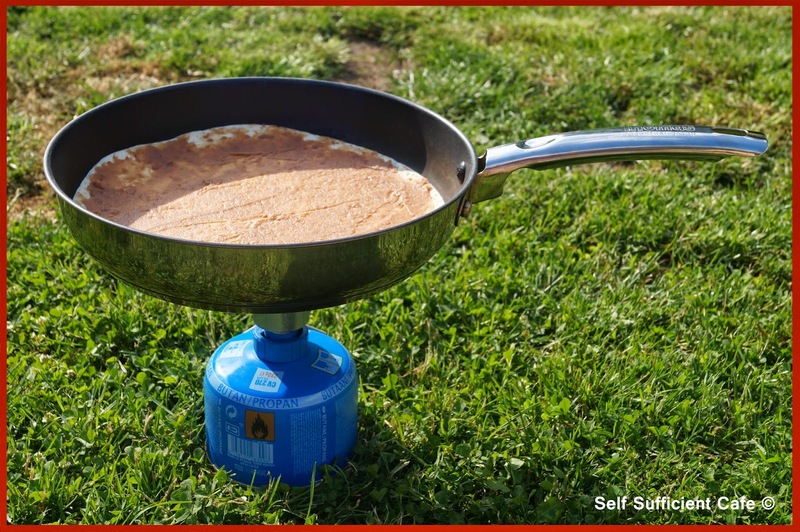 As you already know from my previous post - June is "Camping month" and I promised you a few camping recipes, which are easy to make using just a camping stove, tasty as home cooked food and quick so you can get to satisfy those hunger pangs after spending a day in the great outdoors. 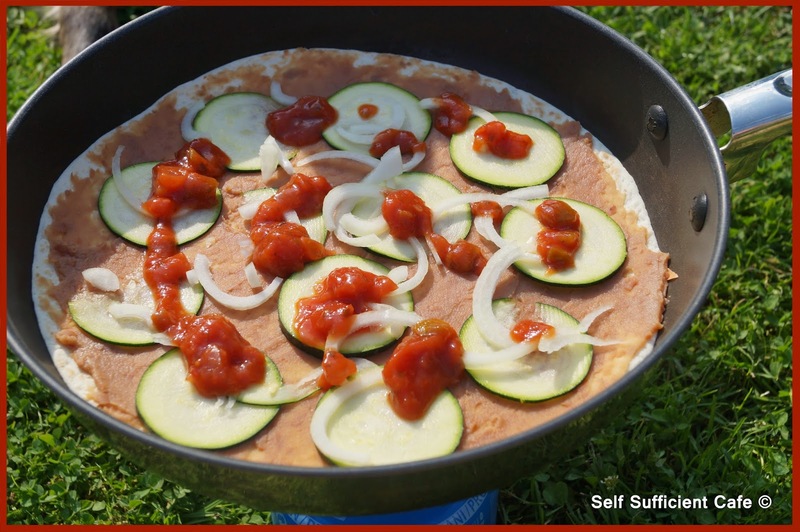 Spread 2 Tbsp of refried beans onto one of the eight tortilla's, and place in a dry frying pan refried beans facing up. Add 2 Tbsp of the salsa. 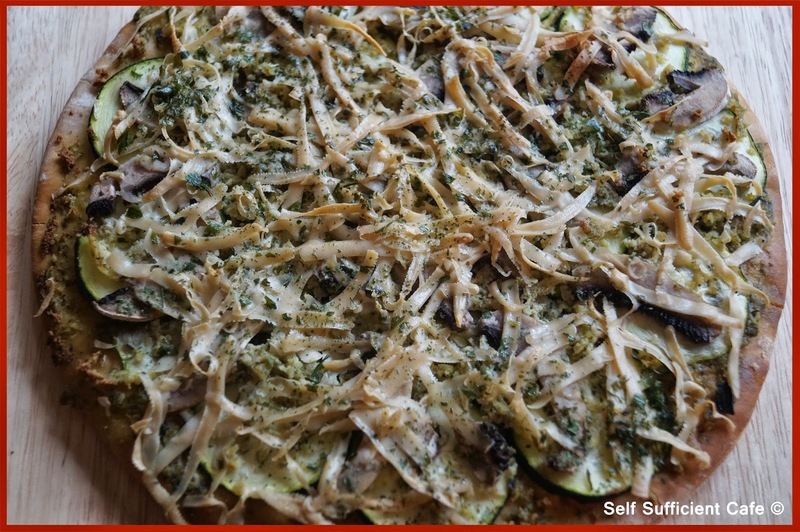 Sprinkle with a little of the grated vegan cheese and if your using top with the vegan mayonnaise and/or jalapeno slices. 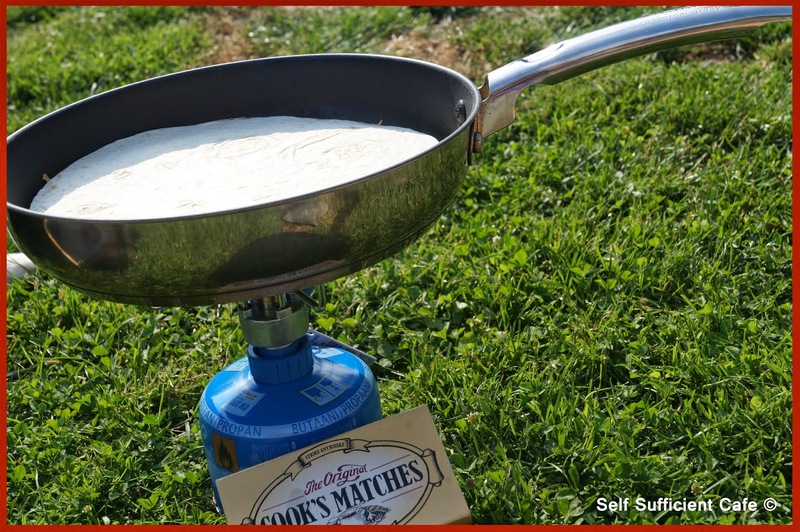 Top with another tortilla and turn the gas stove on to a medium sized flame. 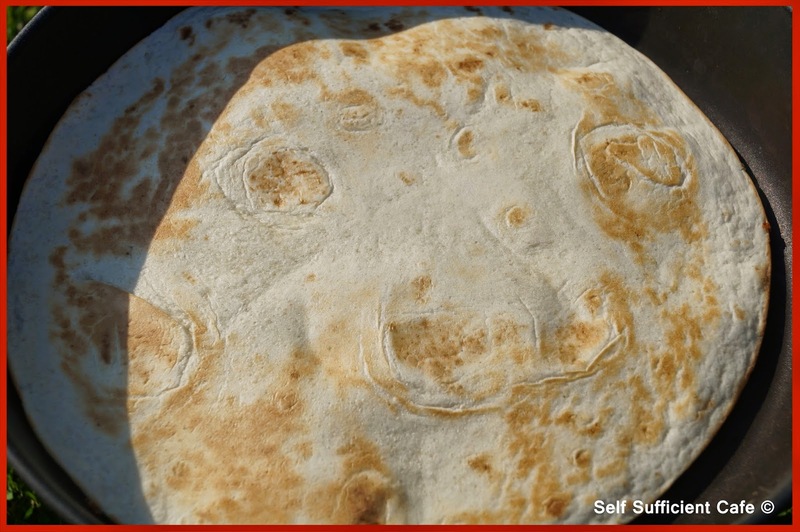 Cook for 2 minutes and check to see if bottom tortilla has started to go a golden brown and flip. If your pancake tossing skills are good then go for you life or if your like me transfer to a plate and flip before returning to the pan. Cook for another 2 minutes and cut into four slices. Leave fora couple of minutes as the filling is extremely hot! Repeat for the remaining tortillas, you may have some refried beans left over, but don't worry these won't go to waste you can use them in a one pot chilli the next day. Marco was also keeping his eyes on the quesadilla's! Although he soon spied his ball and was off chasing that! You don't have to stick to Courgette and onion, any vegetable will be fine just remember to slice it thinly so it cooks through. Another favourite of mine is mushrooms and sweetcorn. In honour of being part of the Suma Bloggers Network I have dedicated this pizza to Suma. All the ingredients can be bought from their shop bar the two fresh ingredients mushrooms and courgettes. I apologise for the bad photographs, I didn't have time to set up a photo shoot as I was ravenous! Ingredients - serves 2-4 depending on how hungry you are! 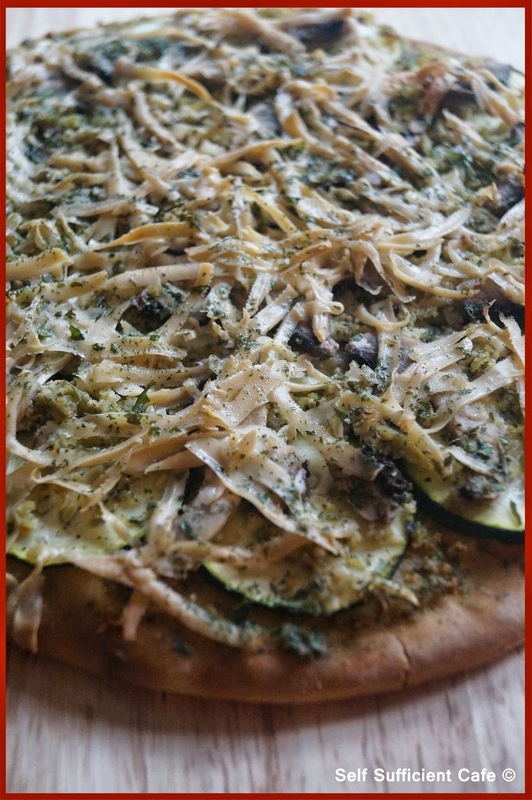 Spoon 3 Tsp of pesto on each pizza base and top with the sliced courgette and mushrooms. 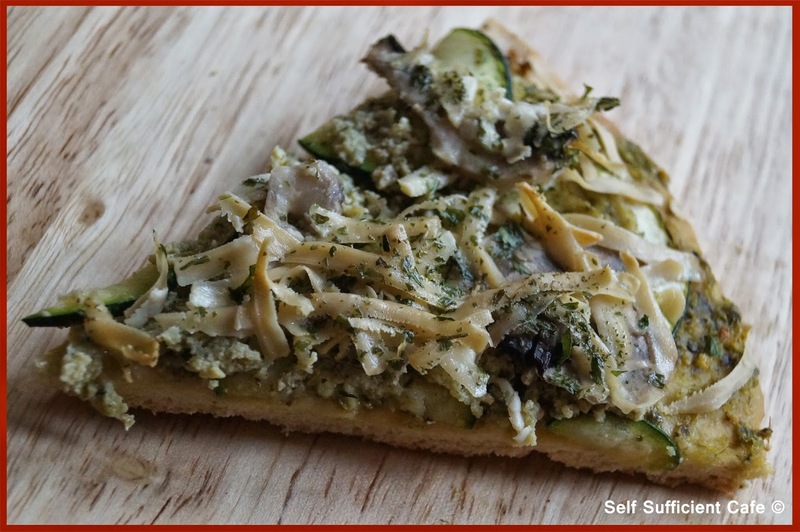 Mix the tofu basil and cheese together and sprinkle over the courgette and mushroom slices. Top with a dusting of mixed herbs. This morning I set my alarm for 4:30 am, yes 4:30, so I could watch the sunrise on the longest day of the year. I was hugely disappointed as it was so cloudy I never actually got to see the sun but the sky was pink, orange, yellow and a smokey purple just beautiful. As I watched the sun rise through the clouds I completed 8 repetitions of the sun salutation yoga sequence as a celebration to Summer Solstice; the doorway to the second half of the year. But before we all start thinking about the nights drawing in and Winter fast approaching as we've reached the longest day of the year, stop and immerse yourself in the glorious season we call summer. Invite your friends around and throw a party, sit outside and enjoy the long days and warmer evenings. 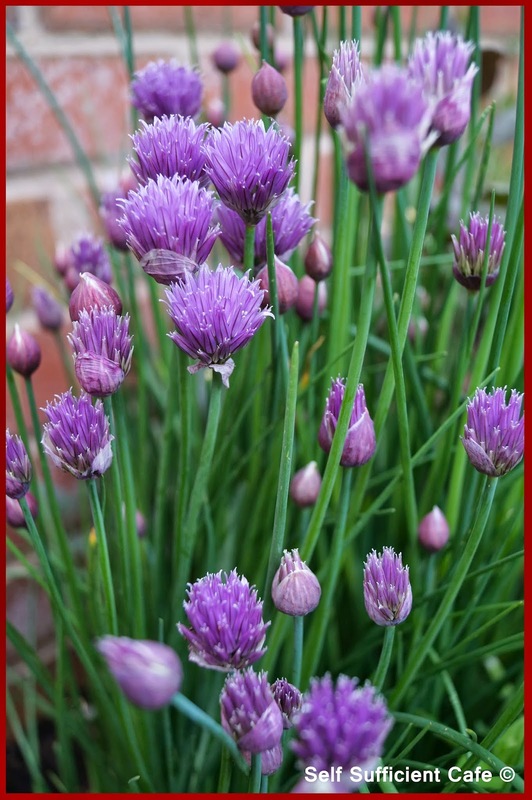 If you're a kitchen gardener like myself you'll be harvesting plenty and enjoying the fresh tasting home grown food you have put all that care and attention in. 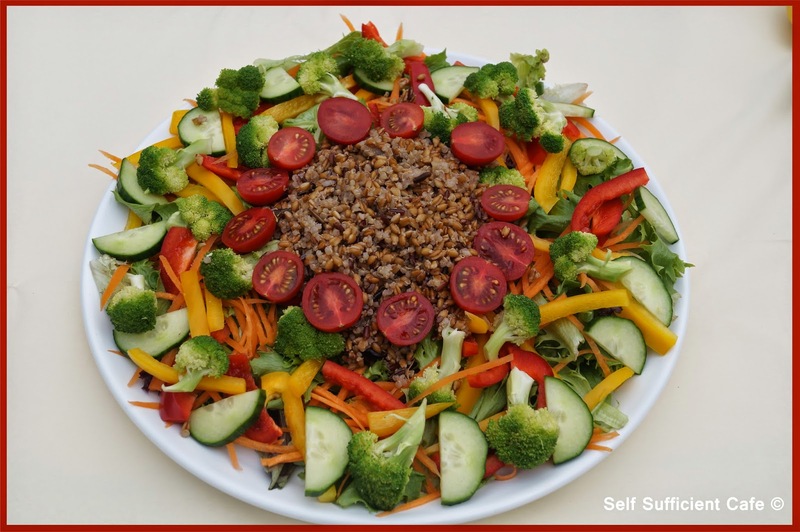 Today I made my Summer Solstice Salad, I don't just eat this once a year, that would be silly! 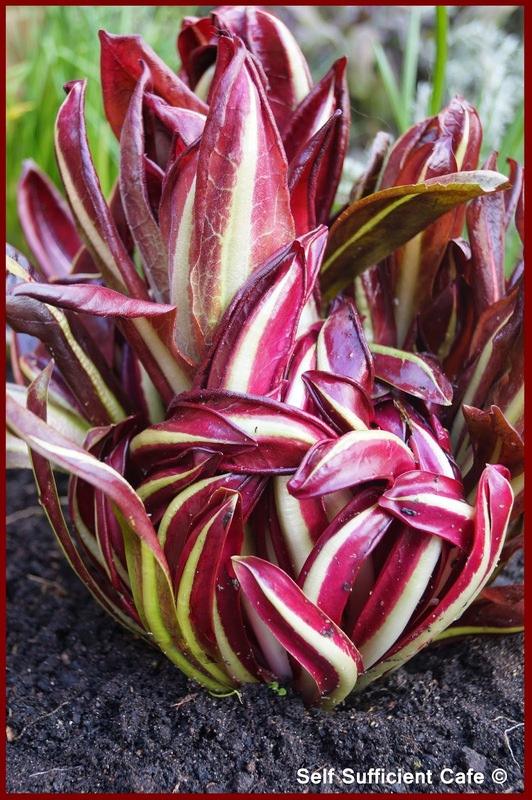 But as this is the longest day it is packed full with colour, flavour and of course health benefits. 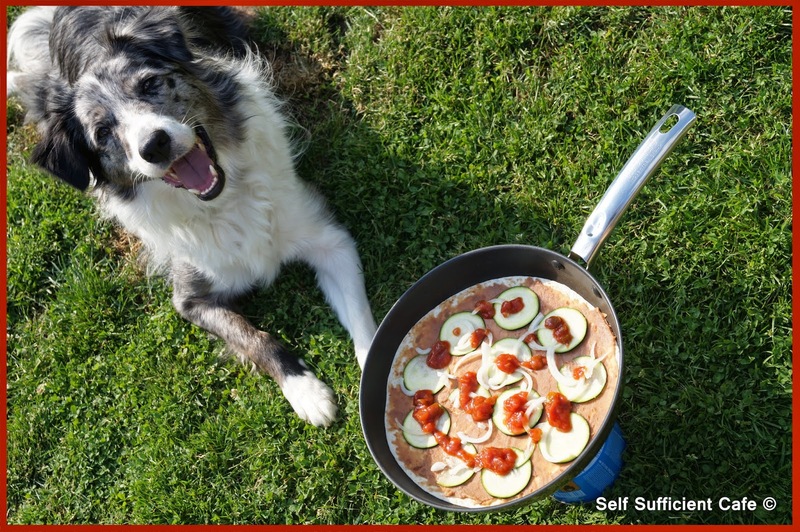 *As I was busy in the garden I didn't have much time to spend in the kitchen so I used one of my go to store cupboard ingredients; A packet of "Waitrose Love Life Spelt, Quinoa, Red Rice & Wild Rice". 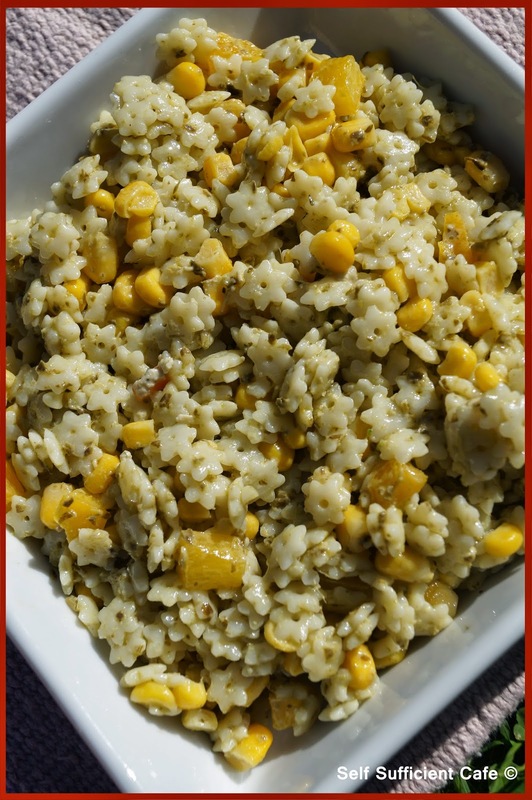 It can be eaten hot or cold and is a blend of 4 grains. First make the dressing for the salad, in a blender add the basil tofu, extra virgin olive oil, white wine vinegar, vegan pesto and soy cream and blend. Add 1 Tbsp of the lemon juice and a good grind of black pepper and a little pink Himalayan salt and blend again. Transfer to a screw top jar and store in the fridge until ready to serve. Note: If you don't want to use soy cream you could make a batch of cashew cream and use that instead but I chose to use soy cream as I had limited time. Steam the broccoli until just cooked, drain and set aside to cool. Arrange the salad leaves on a large plate and sprinkle over the carrot and peppers. Top with the cooked and cooled broccoli and cucumber slices. Dress the cooked grains in the remainder of lemon juice and mix. 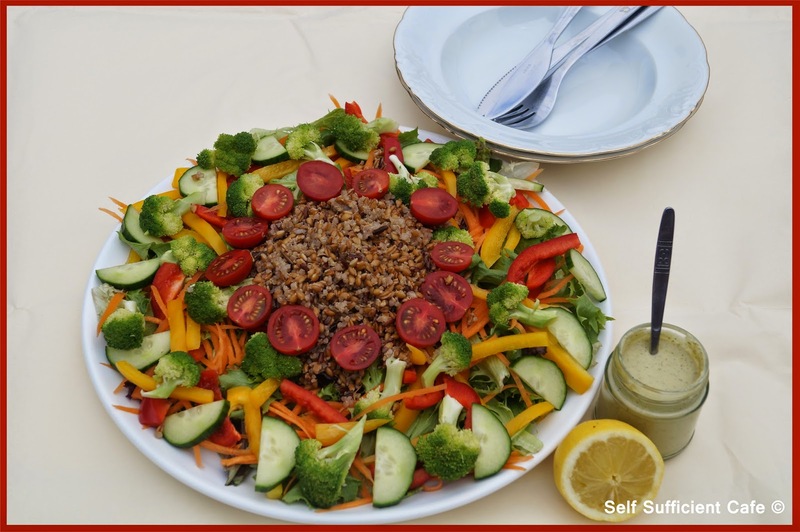 Make a small well in the centre of the salad leaves and fill with the cooked dressed grains. 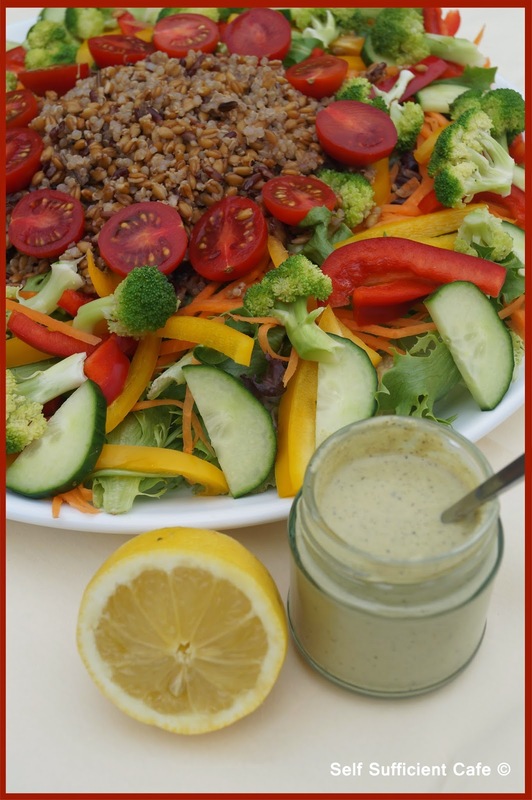 Arrange the cherry tomatoes around the cooked grains and serve with the dressing on the side. 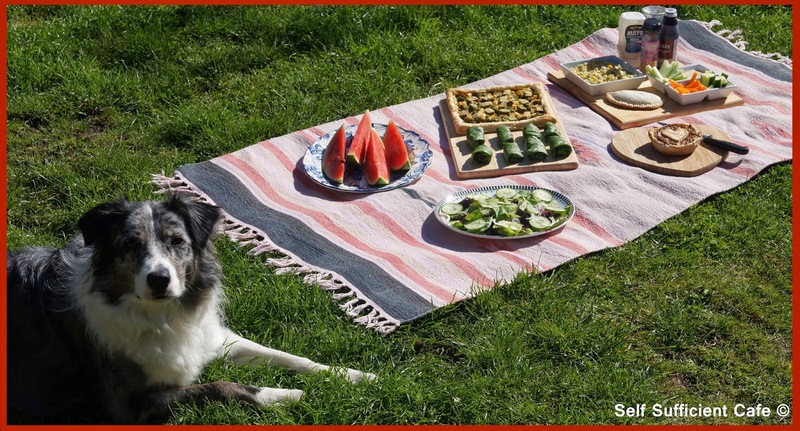 Hands up who knew it was International Picnic Day today? What a gorgeous sunny day it was too! 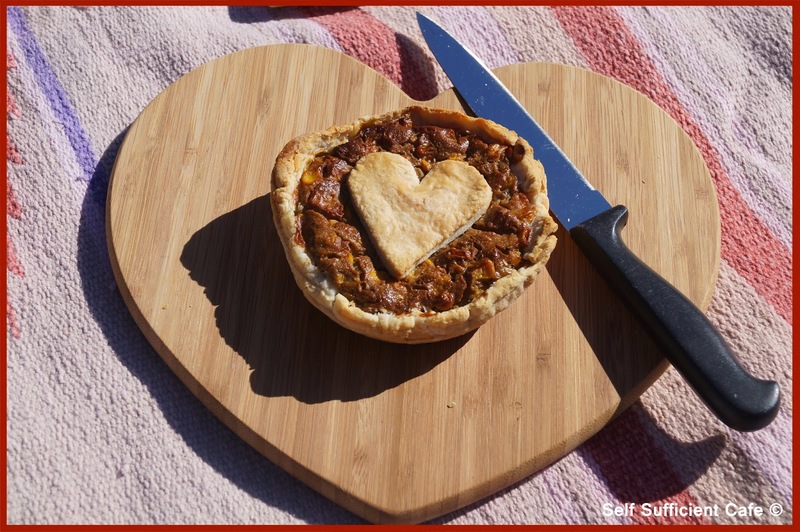 Perfect for a picnic, unless of course you've been stuck in meetings all day like I have! 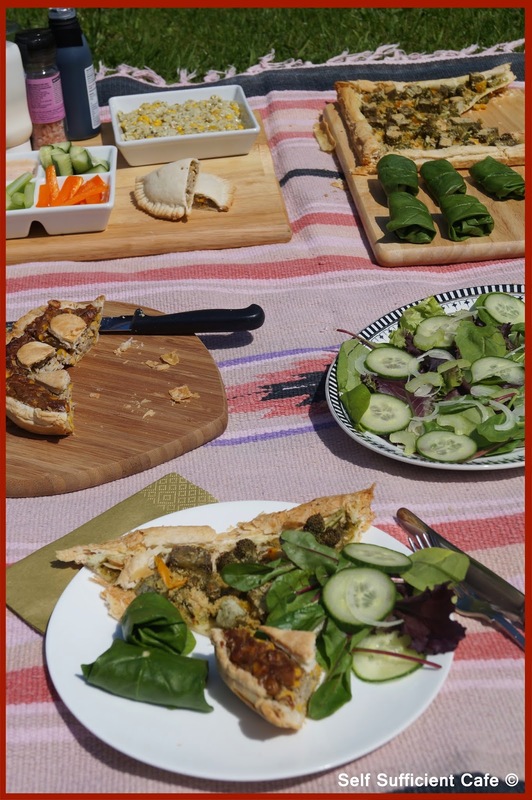 Weather reports are forecasting a glorious weekend so why not make my picnic recipes and head out into the great outdoors? The picnic recipes were supposed to be for two, but when I made them I was feeding four people. All you need to do is halve the recipes if you just want a picnic for two and of course double them if you're feeding 8! My favourite item in the picnic hamper without a doubt was the porcini and sweetcorn tofu quiche which my sister couldn't get enough of. As you can see from below the filling can either be used in a quiche or as a filling for a pasty, both taste so good. With all that pastry I had to balance it out with some spinach rolls which were equally as delicious and make a great change to sandwiches. Roll out the pastry if you haven't already bought pre-rolled to fit the size of a small pastry dish. Press the pastry into the dish and blind cook for 10 minutes in a moderate oven. The pastry will shrink a little, but don't worry about this. While the pastry is baking blend the tofu and milk in a food processor until smooth and transfer to a bowl. Add the porcini powder, garlic granules, salt & pepper and mix to combine thoroughly. Add the sweetcorn and give the mixture another stir. 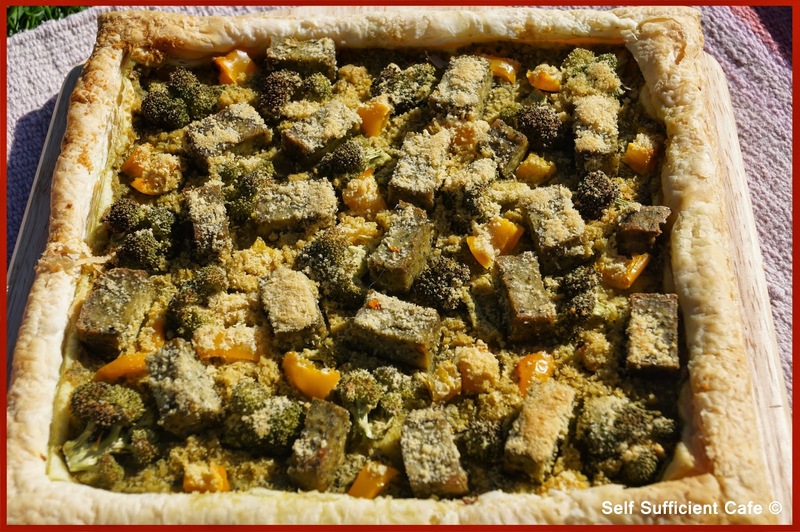 Remove the pastry case from the oven and pour in the tofu mixture, bake in a moderate oven for 20-30 minutes or until the pastry is fully cooked and the tofu mixture has 'set'. Roll out the pastry if you haven't already bought pre-rolled and score a border about 2cm in from the edge all the way round. Spread the pesto over the pastry up to the border you have just scored. Top the pesto with the yellow pepper, broccoli and basil tofu. Put the nutritional yeast into a pestle and mortar and grind to a fine powder. Add the ground almonds and mix to combine. Sprinkle this over the top of the vegetables as you would Parmesan cheese. Back for 20 minutes in a moderate oven. 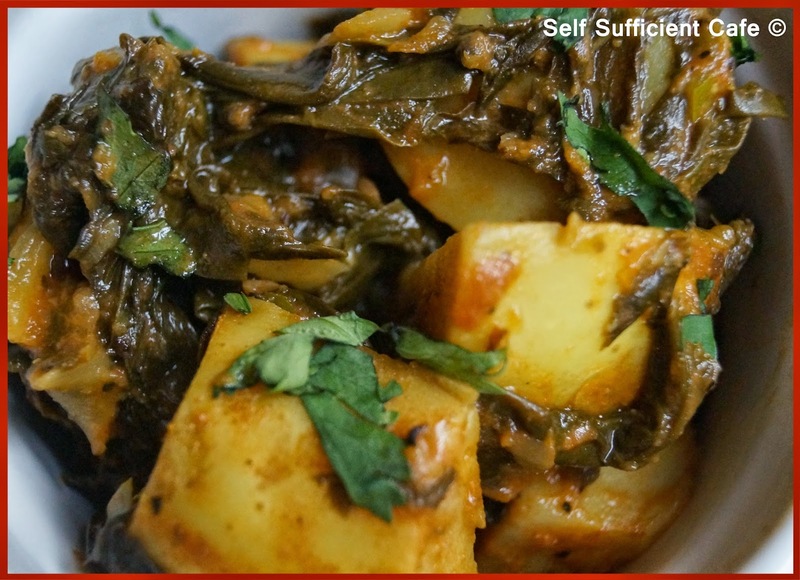 Transfer all ingredients except the spinach leaves to a large bowl and thoroughly mix, you are looking for the consistency of a 'sandwich type filling'. 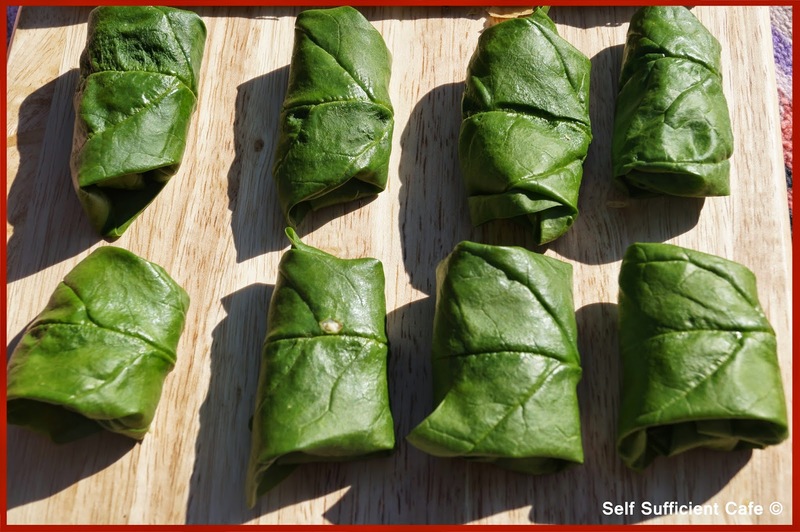 Place a spoonful of the mixture onto each spinach leaf, fold in the sides and roll up like a tortilla. Cook the pasta shapes as per the packet instructions, drain and rinse with cold water to cool and stop the cooking process and drain again. While the pasta is cooking/draining, finely dice the yellow pepper. Add the vegan mayonnaise and pesto to a bowl and mix. Add the yellow pepper and sweetcorn and mix again. 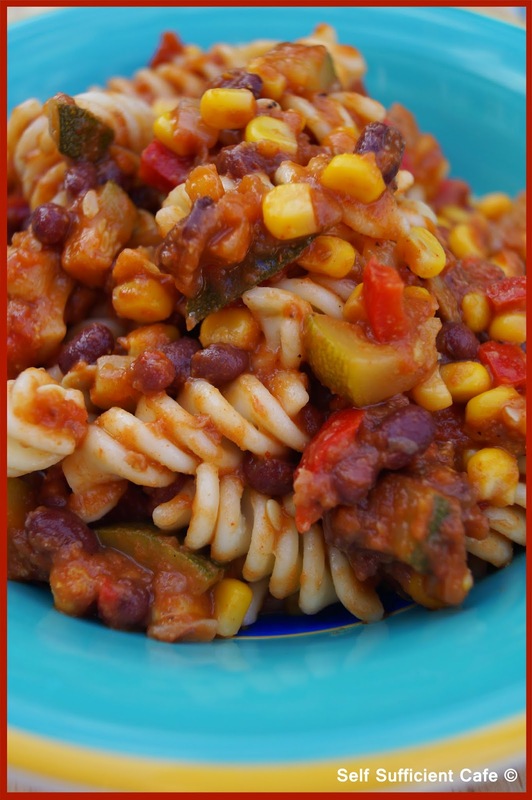 Add the drained and cooled pasta shapes and give everything a good mix to combine. If the pasta salad is a too dry for your liking add more mayonnaise and pesto. Cut the vegetables into crudites, you can use any vegetables you fancy really, why not try carrot sticks, babycorn or mange tout instead. 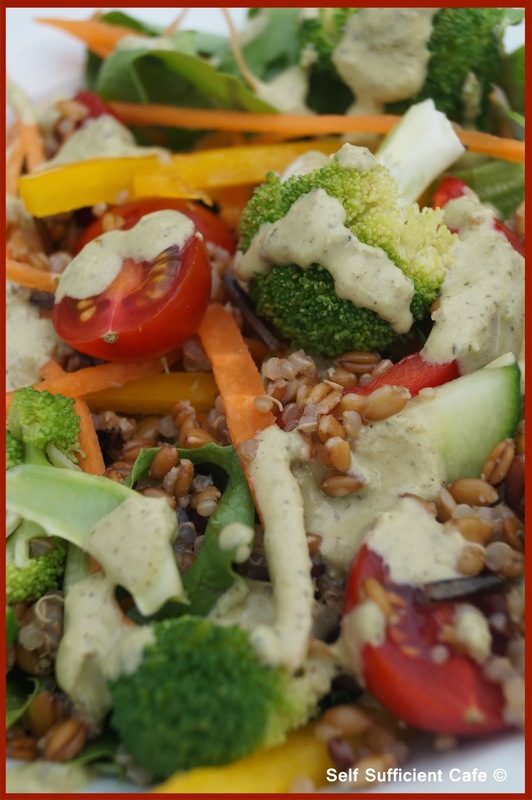 Mix the vegan mayonnaise with the Harrisa paste, add more Harrisa if you like a bit of heat and transfer to a dipping tray. 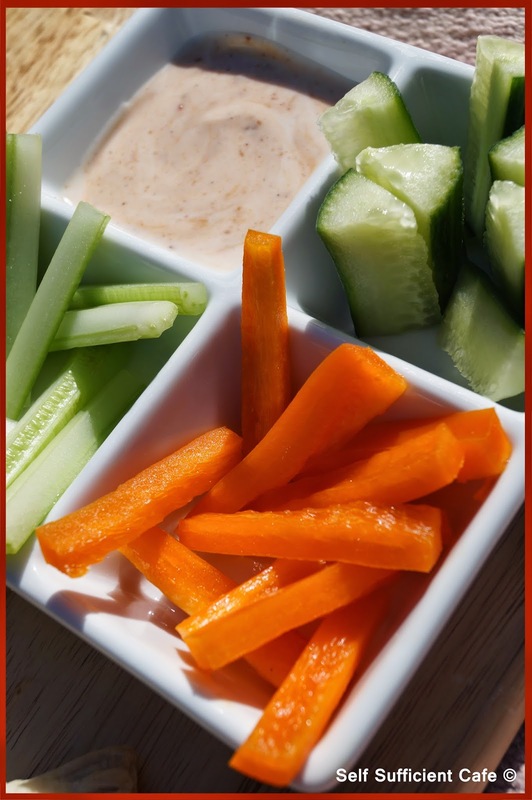 Arrange the crudites around the dip and serve. 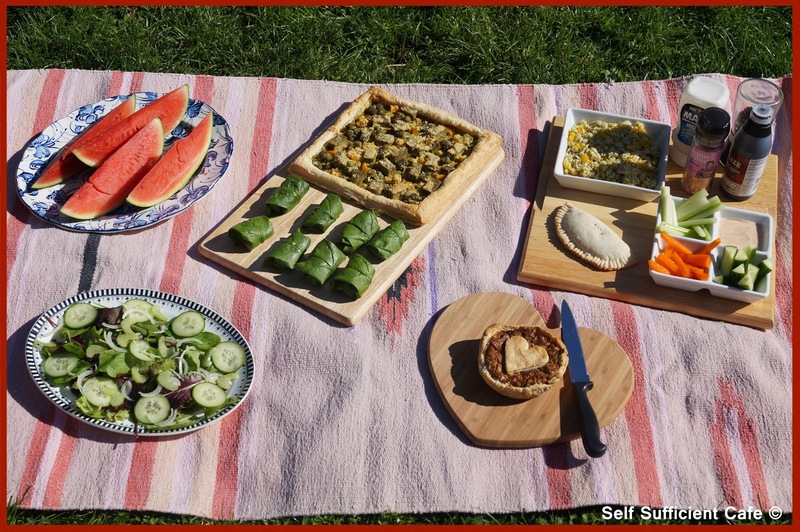 To finish off my picnic hamper I also made a green salad and sliced up ½ a watermelon for afters. Pack up the food and venture outside, find a lovely spot and enjoy! Marco had his eyes firmly on the cucumber sticks AND the watermelon! 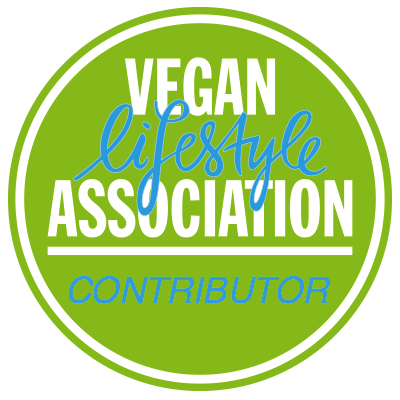 I am over the moon to have been chosen to be part of the Suma Bloggers Network, which is made up of 12 vegetarian and vegan food bloggers from all over the UK. Every two months I will be sharing a recipe I have created using ingredients from the Suma Co-op. Suma is the UK’s largest independent wholefood wholesaler/distributor and are a workers’ co-operative committed to ethical business. If you haven't already you must check out their on line shop, everything they sell is vegetarian and many products are vegan. They pride themselves in being vegetarian/vegan, ethical, fair trade and are conscious of the environment and are carbon neutral! How fantastic is that? Their shop doesn't just sell food either, you can buy cosmetics, cleaning products, eco gadgets and gifts, clothing, toys and vitamins & minerals to name a few. Many thanks to Amy and the team at Suma Wholefoods for this fantastic opportunity, which I know I will thoroughly enjoy being part of. Click on the Suma Bloggers Network logo to the left for a list of all the bloggers in the network. 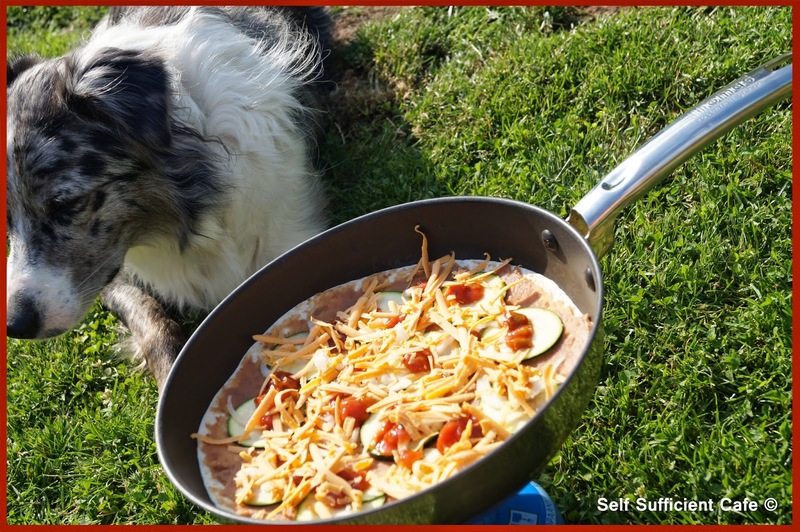 This month, with all the time I am spending in my garden I decided to create a quick & easy Moroccan Dish using readily available ingredients including store cupboard essentials; making dinner just that little bit easier when you are short on time. 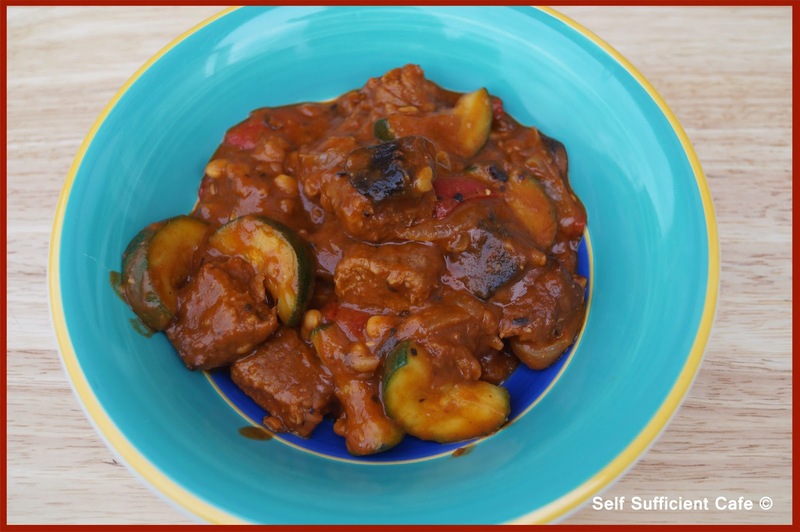 As today is "Eat your Vegetables Day" I had to create a recipe that used a good dose of your 5 a day (or more) and whipped up a Vegetable Tagine in no time at all. Don't be put off with the long list of ingredients it doesn't mean hours in the kitchen. First prepare the tofu. 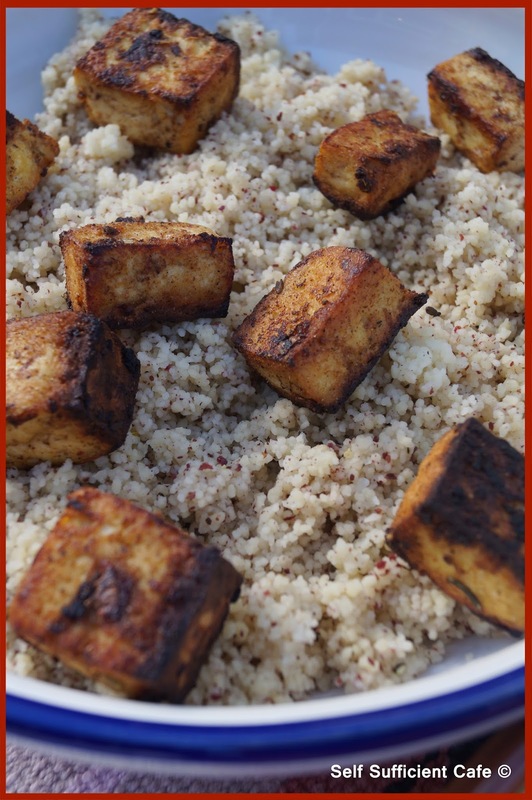 Mix together 1½ Tbsp of the light olive oil, lemon juice, garlic and Ras El Hanout to combine and pour over the pressed & cubed tofu. Leave to marinade for at least 30 minutes, but longer if you can afford the time. You can prepare the tofu in the morning and leave the marinating tofu in your fridge all day, ready for dinner. Next start on the tagine. Fry the onion in the light olive oil for 3 minutes, then add the diced carrot and fry for another 3 minutes. Add the cauliflower and continue to cook over a low heat for another 3 minutes stirring continuously. Add the broccoli and aubergine and cook for another minute before adding the tinned tomatoes. Stir to combine all the ingredients. 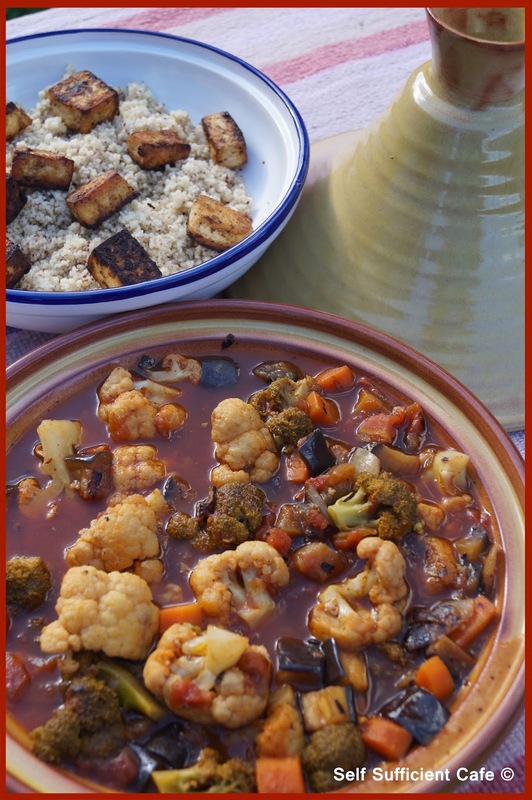 Dissolve the vegetable bouillon powder in the hot water and add the lemon tagine paste and pour over the vegetables. 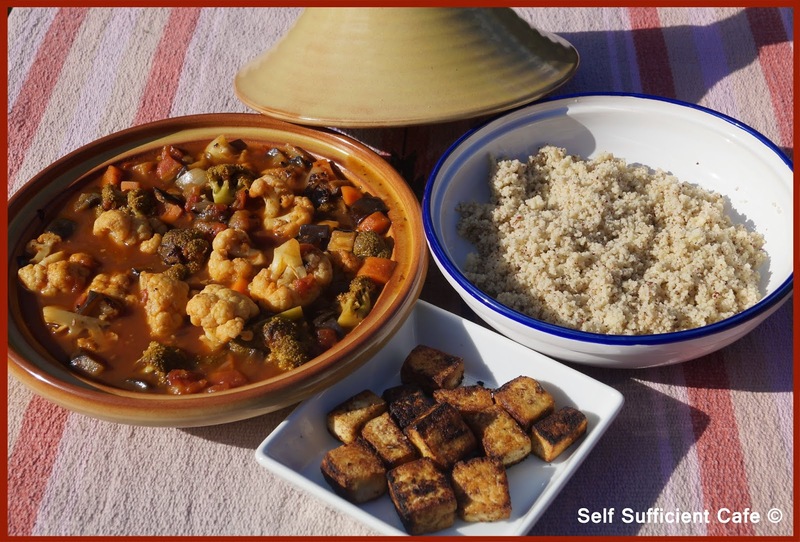 Bring the mixture to a simmer and transfer to an oven dish or tagine pot. Cover and cook in a moderate oven for 30 minutes or until the vegetables are tender. Meanwhile, remove the marinating tofu from the fridge and let it reach room temperature. Add the remaining 1 Tbsp light olive oil to a frying pan and heat to smoking hot. 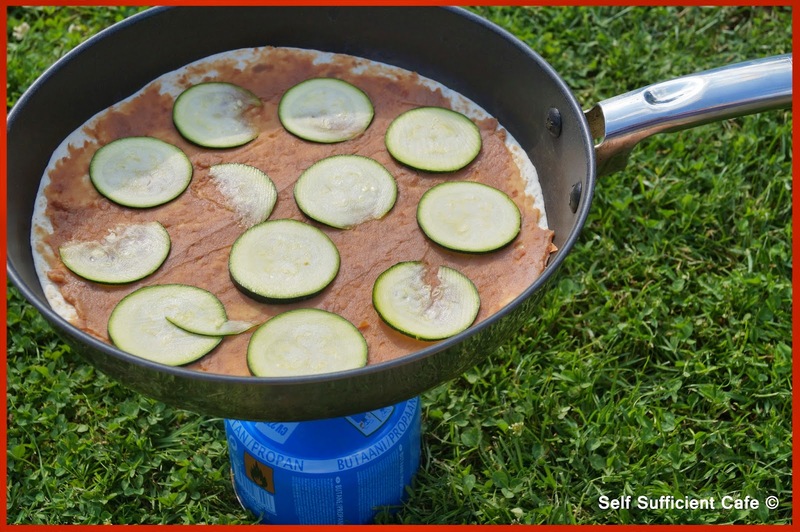 Add the tofu to the pan and fry on all sides, you may need to do this a little at a time depending on the size of your frying pan. Finally, prepare the couscous. Pour the hot water over the couscous and give it a quick stir. Cover and let sit for 5 minutes before forking over the couscous to break it up. Add the sumac and lemon zest and mix thoroughly. 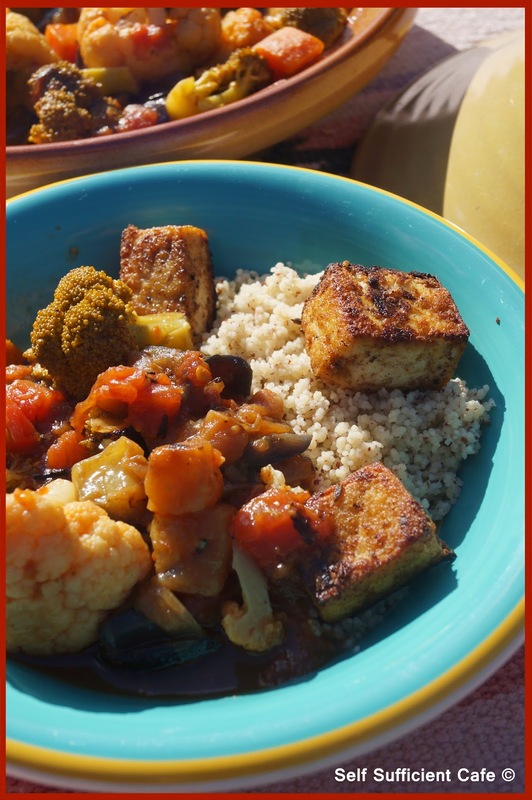 Serve the vegetables over couscous and top with the tofu. 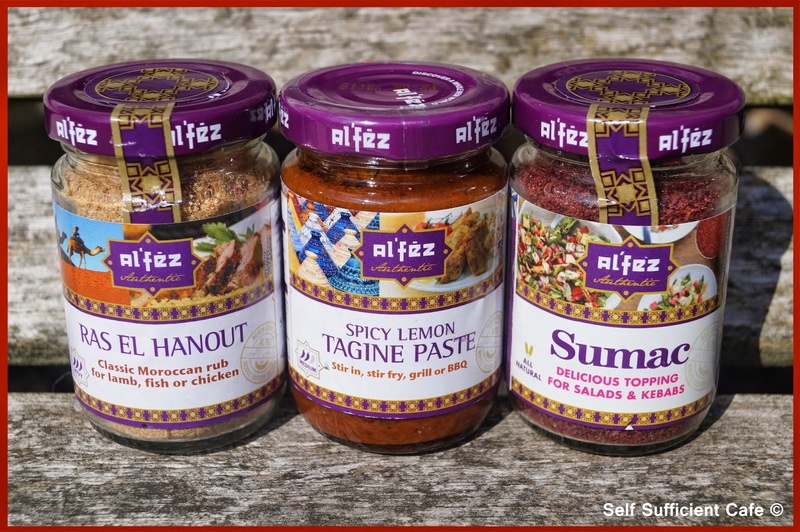 A taste of Morocco that is worth eating outside in the sunshine! 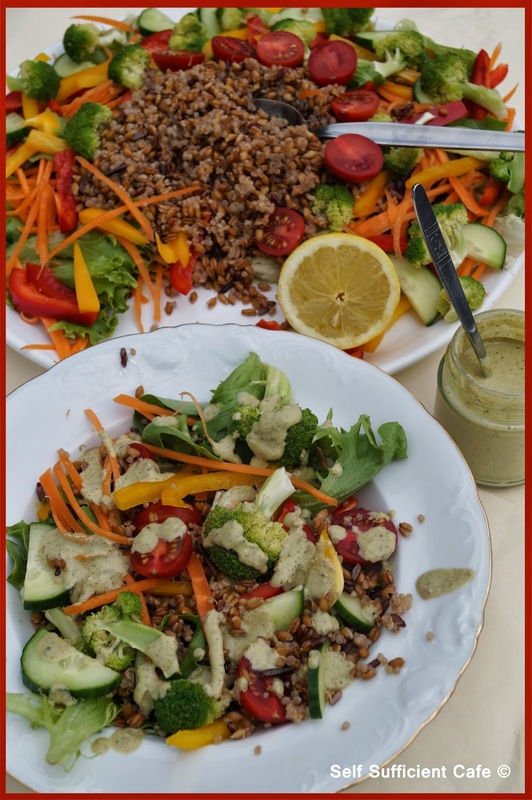 Yesterday I explained that I had been busy in my small garden and therefore had not posted a recipe from my June menu, but as the June menu showed I do have something to share with you for Fathers Day. To make up for the lack of recipes I haven't got one recipe for you, nor two recipes but four! 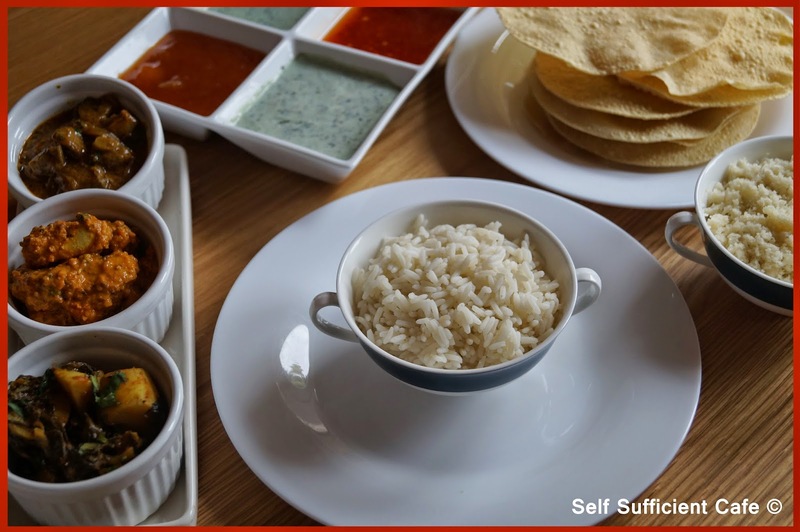 You don't have to make this just for Fathers day invite some friends round and have a curry party. That's right my Fathers Day Menu is a 'thali'. 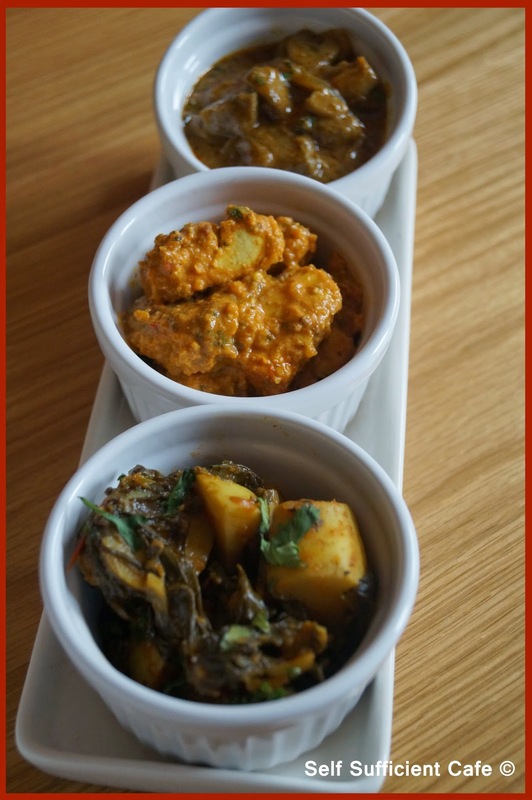 Three different curries, with rice, cauliflower rice, poppadoms and mint raita. 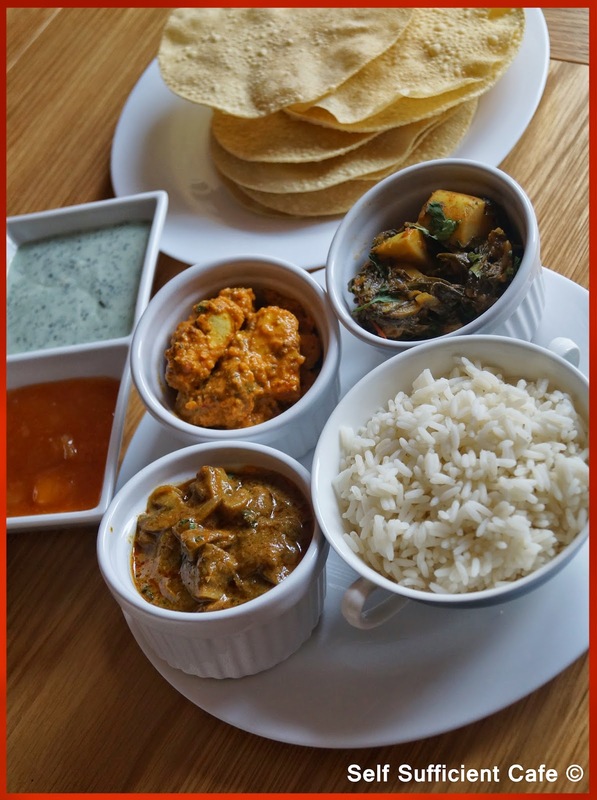 As it was Fathers Day I wanted to spend my time with my Dad and not in the kitchen all day preparing the meals, so I'll be sharing my cheats version for the third curry and the mint raita. 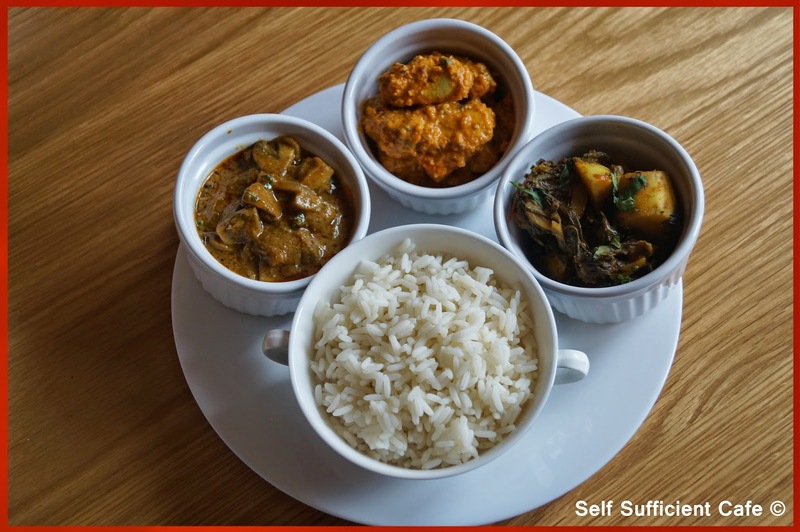 You can make all three curries the day before and reheat, in fact most curries taste better the next day! Cut the potatoes in half if they are small or quarters if they are larger, you want all pieces to be roughly the same size so they all cook through. Fry the onion in the oil for 5 minutes or until translucent, add the garlic, ginger and the spices and cook over a low heat for another two minutes continuously stirring so nothing burns. Add the potatoes and stir so they are coated in the onion mixture. Add the tomato and continue to cook for another 5 minutes until the tomato has broken down. If the potatoes start sticking add a splash of water to the pan. Dissolve the vegetable bouillon powder in the water and add the tomato puree, stir to combine and add to the pan of potatoes. Continue to cook until the potatoes are cooked all the way through, about 15 to 20 minutes. Add further water if they start sticking to the pan. Note to self, next time I make this I will par-boil the potatoes first! Add the shredded spinach to the pan about 5 minutes from the end and wilt, you will need to do this in batches unless you have used a big pan! Add the coriander, saving a little for a garnish. Dry fry the coriander and cumin seeds until they release their aroma and then grind in a pestle and mortar to a fine powder. Tip into a bow and add the next 7 spices and mix, add a good grind of black pepper and a smaller grind of Himalayan pink salt and mix again. Add the vinegar and water and mix to a paste. Transfer half of the paste to a bowl and add 4 Tbsp of the soy yogurt to make a marinade. Dice the tofu and tip into the marinade. Leave the tofu to marinade over night if you can but if you're short on time at least 45-60 minutes. Once the tofu has marinaded you will need to thread them onto skewers and place under a hot grill turning from time to time until the tofu forms a crust of the marinade on the outside. Remove the tofu from the skewers and set a side while you make the sauce. Fry the onion, chilli, garlic and ginger in the oil for 5 minutes or until the onion is translucent, be careful not to burn the ginger and garlic. Add the remaining paste you made earlier and cook for a further two minutes, your kitchen will start to smell wonderful. Add the warm water and tomato puree and bring to a simmer, continue to cook for another 5 minutes. If you want a smooth sauce transfer this mixture to a food processor and blend, but you can leave the mixture to give the dish a bit of texture. Add the tofu to the sauce and mix thoroughly, cook over a low heat and add the remaining yogurt be careful not to cook too quickly as the yogurt will curdle. Cook for another 5 minutes and add the coriander, saving a little for a garnish. Fry the onions in the olive oil until they start to go brown, about 10 minutes. Add the garlic and ginger and fry for another 2 minutes before adding the paste. Cook for another 2 minutes and add the mushrooms. Give everything a good stir to coat the mushrooms with the spice paste, cook for a further 5 minutes. Add the coconut milk, bring to a simmer and cook for another 5 minutes. Add the coriander, saving a little for a garnish. I can't believe this is my first post since I shared my June Menu board, time has flown by. So what have I been up to you ask, why no recipes? In a word "gardening"! I don’t have a massive garden at all, it’s more of a postage stamp in comparison to my family and friends gardens but I have made room for two raised beds. Each bed is 1.8m x 1.8m providing me with 9 individual smaller plots totaling eighteen 0.6m x 0.6m plots where I grow different fruit, salad and vegetables. 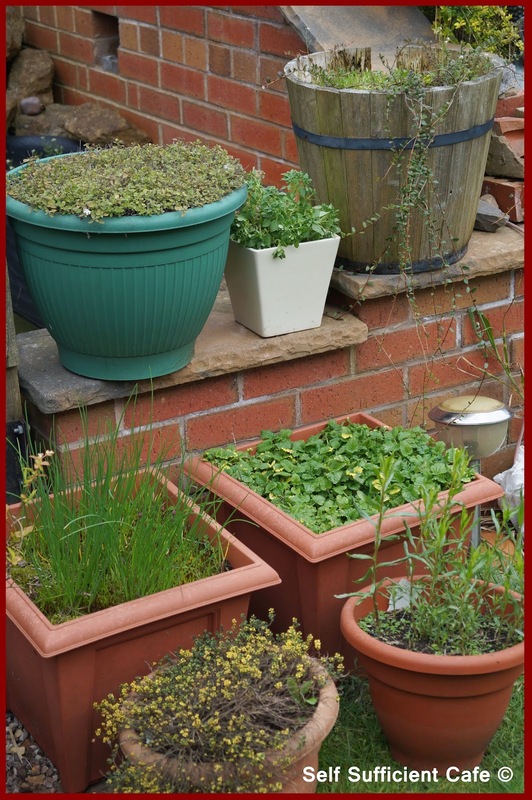 I've also turned my borders into herb gardens and I have collected many different sized pots over the years which are dotted around the garden, where there is space! Throughout the summer I very rarely have to buy additional salad and vegetables, my small garden provides enough for my husband and me. Any gluts I have, I simply trade for something else that is grown at a friend’s allotment or in my parent’s garden. You don’t need a big garden to grow your own, and remember the bigger your plot the more time it will require. 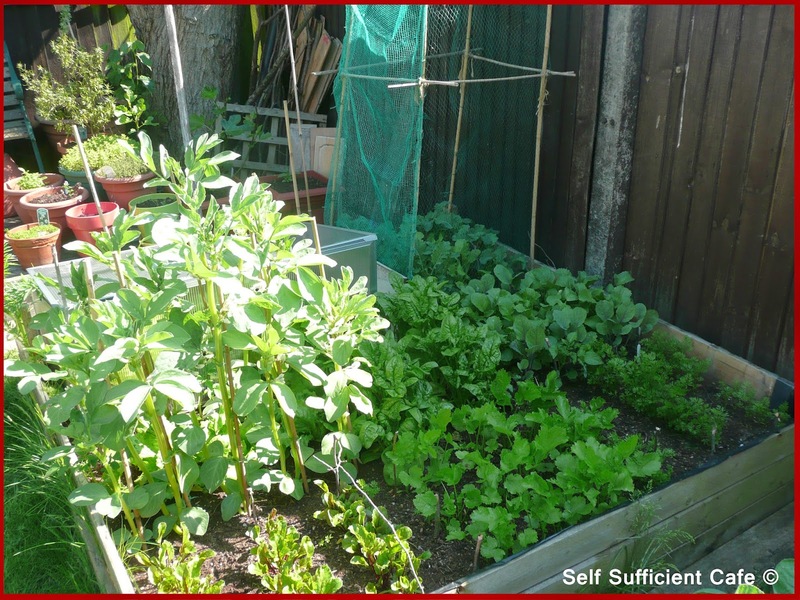 Even small patios can provide fresh salad, vegetables and fruit. 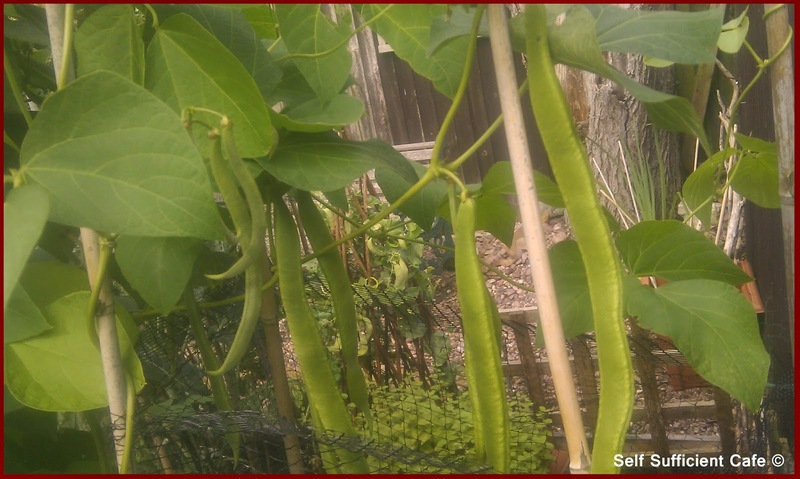 Everyone should grow some food themselves, it is cheaper, tastier and so much fresher. You really can’t beat wandering out into your garden, harvesting something you've grown and turning into a meal and all within minutes. Go on give it a try. 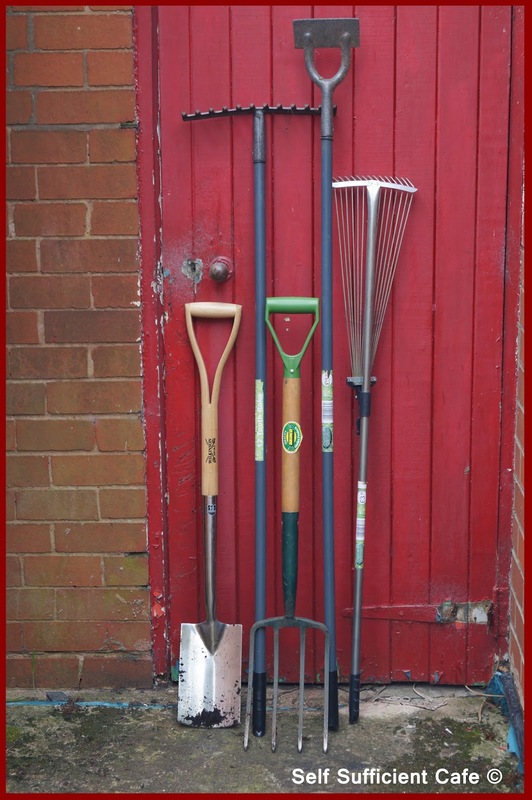 Gardening is much easier than you think, most plants look after themselves! If you haven’t got a garden, don’t fret, a few plants on your windowsill will provide for you, or just sprout some seeds, full of health benefits. Once you've grown something there is no looking back, nature is such a miracle worker. For more information on my gardening adventures check out my article in the June issue of Fresh Vegan magazine.